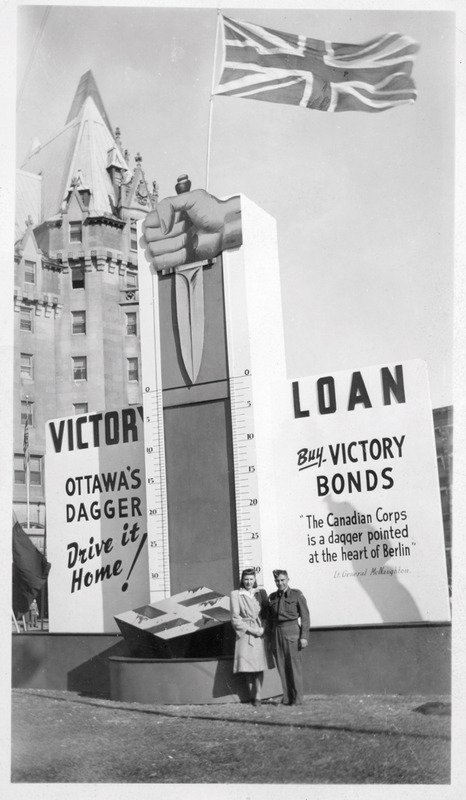 A Second World War-era photo illustrates Canada’s determination to defeat Nazis. Submitted by Anita Hochstein of Glastonbury, Connecticut. This photo shows my mom, Helen Schrempp Hochstein, and her brother Wilfred Schrempp, both of Twin Butte, Alta., in Ottawa in 1943. Born in 1913 and 1916, respectively, Wilf and Helen were the third and fourth children of Bertha Lattman and Fred Schrempp. Bertha and Fred homesteaded at Twin Butte after coming from Hartington, Neb., around 1905 with a group of other ranchers, mostly of German descent. Both Helen and Wilf graduated from the Normal School in Calgary and taught locally until the Second World War. Mom and her friend Mary McIntyre Schmidt took the train to Ottawa after passing an employment test for work with the Canadian government. Mom worked for the Canadian Army, and Uncle Wilf visited her there while serving in the Army. Wilf also served in the Pacific theatre and brought home a real grass skirt from Tahiti. After the war, Wilf ranched and taught in the Twin Butte area until he died in 1982. Mom went back to Twin Butte in 1944 to marry Dr. Francis A. Hochstein, who was also the son of homesteaders from Nebraska. Dad studied at the University of Chicago and at MIT in Massachusetts before a long career with Pfizer. Mom passed away in 2002, but she always spoke fondly of Ottawa and of how she passed up a chance to be photographed by Yousuf Karsh. This article originally appeared in the December 2017-January 2018 issue of Canada's History magazine. How a Canadian Vietnam veteran sacrificed all in order to win greater respect for his brothers in arms.